Succulent autumn fruits baked under a wonderful, crumbly scone lid. Fantastic cold the next day – if there is any left! Place the apples in a pan with the apple juice and simmer gently together for 15 minutes until the apples have softened. Meanwhile, preheat the oven to 180C, gas mark 4. Place the flour and baking powder in a large bowl and rub in the butter using your fingertips. Stir in 75g of the sugar, the soured cream and beaten egg. 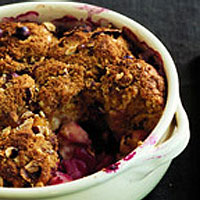 Spoon the softened apples and their juices into an ovenproof dish and stir in the blackberries. Spoon over the scone topping – don’t worry if it doesn’t cover the filling completely and there are a few small gaps. Mix together the hazelnuts and the remaining sugar, and sprinkle over the top. Bake for 30-40 minutes until the topping is risen and golden, and the juices are bubbling (cover the dish loosely with foil if it is getting too dark). Leave to stand for 5 minutes, then serve with either custard or vanilla ice cream. With a kilo of apples in this recipe, a quality cider is an ideal match. This recipe was first published in April 2007.